Following THREE broken driveshafts and a gearbox replacement in qualifying, the Team ABBA with Rollcentre Racing BMW M3 V8 was left without a qualifying time. From last position Martin Short, Richard Neary, Darren Cox (under his Richard Roberts alter-ego) & Charles Lamb took the race by the horns to take not only their class but the overall win putting in 512 laps, three more than their closest rival,Red Camel-Jordans.nl in the TCR class. Richard Neary set the fastest lap of the race putting in a 2:18.217 (average speed of 153.41 kph). As night fell, heavy rain set in and many of the runners found the gravel traps yet 32 of the 41 starters finished the race. There were 16 Code 60 periods totalling 02:09:50 throughout the 24 hour period. At the Competizione GT awards ceremony, held at the Ferrari Museum in Maranello this week, Pasin Lathouras, Alessando Pier Guidi and Gianmaria Bruni were rewarded by Ferrari for their win in The Pro-Am class at last year’s 24 Hours of Spa. Series promotors SRO announced expanded TV coverage for this year’s series including round-the-clock broadcast of the Total 24 Hours of Spa. 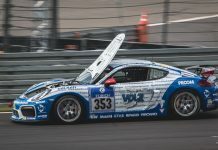 In Europe, Motors TV will cover every round of the Endurance Cup live, while Eurosport will do likewise (or have ‘as live’ broadcasts) of the Sprint Cup. On top of that it will show highlights of the endurance races, which are also being covered by BT Sport in the UK. In Asia Fox Japan has joined and will show ‘as live’ coverage of the Sprint Cup and highlights of the endurance races. Other Asian networks continuing to cover the Blancpain GT Series through highlight programmes are Eurosport Asia, Star Sports, Bloomberg, Fox Sports and Fox Sports 3 Asia. For North America, CBS Sports continues its combination of live coverage and highlights in the United States and Canada, with the endurance races streamed live on Motor Trend. South American race fans are again served by Fox Latin America, which is showing highlights of all races. In the Middle East BeIn Sport will mix live coverage of sprint races with highlights of the endurance series. Official Aston Martin Racing Partner Team TF Sport concluded their pre-season testing this week – see below in ‘Other Series’ for further info. A near capacity 45 car grid has been announced for the season opener at Silverstone on 16th – the surprise additions being a second Aston Martin Vantage GTE run by Gulf Racing and a second SMP Racing BR Engineering BR01 Nissan for Sean Galael, Antonio Giovinazzi and Mitch Evans. The Automobile Club de l’Ouest surprised us on Tuesday by announcing a sixth LMP3 chassis manufacturer, French sportscar builder Norma Auto Concept. 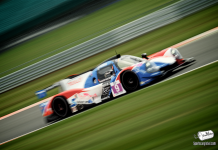 Murphy Prototypes officially announced the news we already knew that Ben Keating, Jeroen Bleekemolen and Marc Goossens will form its three-driver line-up for this year’s 24-Hours of Le Mans, driving the team’s Oreca 03R. Sir Chris Hoy will race the Algarve Pro Racing Nissan-powered Ligier JS P2 chassis at Le Mans and at the opening two rounds of the European Le Mans Series. The Porsche Hybrid team took the cars to Spa this week for additional private, post Prologue testing runs – we understand they were running the low downforce bodywork as Le Castellet was all high downforce. Audi, Toyota, Tequila Patron ESM, Ford and Proton Competition took advantage of additional running time at the Paul Ricard circuit between Sun-Tues following the finish of The Prologue. Manor WEC confirmed on Wednesday that Roberto Merhi will rejoin the team to complete their 2016 driver line up. Merhi last drove for Manor in 2009 in Formula 3. 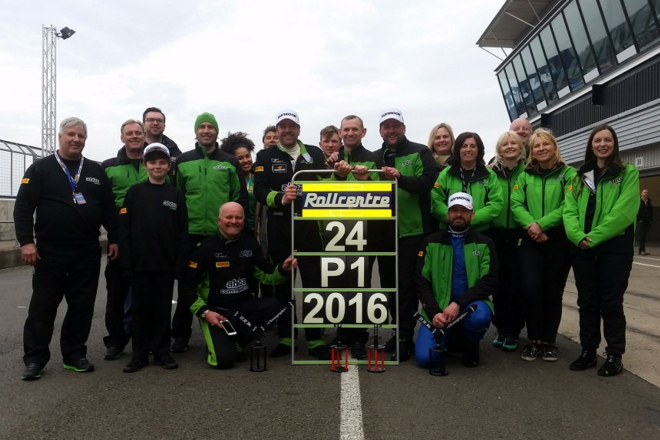 Torrential rain brought a halt to the first round of the revised Dunlop Endurance Series at Silverstone. Phil Hanson and Nigel Moore, in the #19 Tockwith Motorsport Audi R8 LMS took the win, both FF Corse Ferrari 458s crashed out on lap 1. A war of words has broken out between Oreca (the promoter) and the FFSA following the season opening round of the French GT Tour at Nogaro where only nine cars were entered and just eight cars started both races! Sacha Bottemanne survived a massive crash during the first race on Easter Sunday when he misjudged an overtaking move and his Ferrari hit the concrete wall at high speed, totally destroying the car. Official Aston Martin Racing Partner Team TF Sport concluded their pre-season testing tour of the ‘sunnier’ European tracks at Circuito do Estoril in Portugal on Monday. The team has a packed schedule this year with full-time programs in the Michelin GT3 Le Mans Cup, International GT Open and the British GT Championship! McLaren GT supported Garage 59 confirmed it will enter two 650S GT3s in the International GT Open series this season. Duncan Tappy and Michael Benham team up in one of the team’s McLarens; Swedish driver Alexander West will race the second car with an announcement on his team mate due soon. The #5 Phoenix Racing Audi R8 LMS took the overall win in the VLN with a time of 4:04:25.984. The #15 Audi Sport Team Phoenix R8 LMS was second with the Mercedes AMG GT3 of Team Black Falcon rounding out the overall podium. Getting in some circuit time prior to his assault on the Nurburgring 24 hour later this year, factory Aston Martin Racing drivers Fernando Rees and Marco Sorensen debuted at the Nordschleife in a Vantage V8 GT4 for the opening round of the VLN series finishing third in class. Formula E announced more details on the new autonomous racer that we will see later this year. Designed by Daniel Simon, former senior designer at Bugatti, who has designed everything from spaceships to Le Mans cars throughout his career it will feature some huge aero produced by the floor and “active body parts that are more organic and seamless than solutions today”. It all sounds amazing but we are left with one question: why? A little more conventionally (if electric racing can be classed as ‘conventional’), Brazilian Lucas di Grassi held off a hard-charging Stephane Sarrazin to claim victory at the Formula E Long Beach ePrix on Saturday. 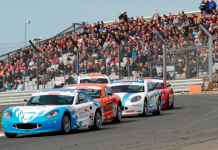 In it’s first competitive UK outing, the Ginetta G57 dominated Saturday’s inaugural round of the Dunlop Endurance Championship at Silverstone with a podium lockout. Lawrence Tomlinson, Chairman of Ginetta, took the win with Sir Chris Hoy in second.